INTERNSHIP GUIDE Are you in the process of applying for your dream internship? Check out our article about how you can get the internship of your dreams! MARCH MADNESS A lot of students on campus have been following the NCAA’s March Madness games... but which team will come out on top? Read our article all about March Madness. SPRINGTIME SELF-CARE Spring is finally here, no more freezing mornings and evenings! In order to take full advantage of the warm weather, take a look at our self-care article, perfect for spring. Women in Ministry: What’s the Point? 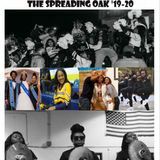 Interested in writing for the April edition of The Spreading Oak? DM the USM Instagram page (@ou_usm) OR email thespreadingoak@ gmail.com! If your goals look anything like mine, there are thousands of other people hoping to break into your industry. If you want to get there, you’re going to need a lot of help. Before I sent my application off to Apple Inc., I sent it to alumni friends, industry contacts, professors, and my mom. Each individual offered a different perspective that helped shape my eventually successful application. It’s hard to accept criticism of something that you’re putting your heart into, but you’ll learn about the style expectations of your industry, how those of other generations might perceive your writing, and what has worked for recent graduates in your field. Just make sure you request reviews well before the application’s due date, because there’s no telling how long it might take to get notes back from everyone. My name is Giana Darville. I’m a 20-year old junior public relations major, and I will be interning for Apple Inc. in Cupertino, CA this summer. Yes, it does still feel really crazy to say that. Although this was definitely a God-thing, there are a lot of steps that I took in following Him that led to this amazing opportunity. I want us all to win, so keep reading to see a few ways to land your dream intern position. Your application answers and resume are all your future employers will know about you before an interview. Make sure they fully understand why they should hear more about you, your life, and your experience. Lying is never an option, but make sure your writing will leave readers impressed with your most impactful life experiences. On your resume, limit your job summary to the three most impressive or unusual jobs and respective responsibilities or tasks that you possessed or accomplished. Interviewing is serious business and walking in blindly could set you up for a very embarrassing hour. Be knowledgeable of both the company and current events (no one wants to hire someone that’s ignorant of the world they live in). Ask questions like “what sets your internship program apart from that of similar companies?” and “what attributes does someone need to have to be successful in this position?” Being an active listener is crucial and reviewing your personal statement and goals in advance will keep you from stumbling through answers. Take notes. You’ll have better questions if you keep the information in front of you. Be more concerned with being interesting than professional. 7. Relax, What’s for You is for You During the late May days of the summer before my junior year, I struggled to get out of bed. Before I finally received the one random “yes” in a sea of “no’s,” I felt like a failure and was convinced that I wouldn’t accomplish any of my goals. Even now, I’m still receiving rejection emails from boutique agencies and tiny companies that I forgot I even applied to for next summer. Even with the reality of rejection, you can be sure that the job, internship, or fellowship that God has for you is on its way. Don’t let your concern for the future ruin your present. You only have so much time in college, so make it all count. We have all heard the arguments that ensue within our churches about women’s ordination and women’s spiritual role in the home. In the more general Christian circles, we have had arguments about the “feminine” or maternal characteristics that God uses in the Bible to describe Himself and whether that means Christians should ascribe a masculine or a neutral pronoun to God. To many Christians and Adventists, these discussions seem boring and too theological or political to understand or even care about. By contrast, there is an increasing number of women ministry leaders. On our campus today, approximately half of the ministry leaders are women. Many women ministry leaders, who once found themselves sitting in the comfortable pews of their churches, are now facing the battle of proving themselves in ministry. Institutions, men, and even other women put women leaders up on an impossibly high pedestal, ready to tear them down after any spiritual hiccup. 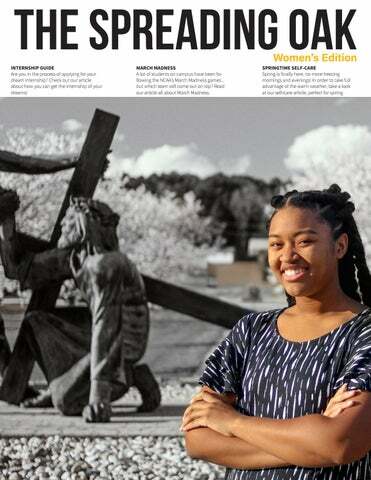 Despite these facts, when I asked the women ministry leaders on our campus what was the most daunting task of being a woman of God, almost all of them agreed it was the task of focusing on their identity and relationship with Christ. Camille Belle, the current AYM Leader said, “Always unapologetically be you... God wouldn’t have chosen you if He didn’t want to use every part of you.” Ignite Leader Christa Horton exclaimed, “Have faith in the calling that God has given you.” Shawnna Campbell, a theology major, concludes with these words, “One of the common misconceptions... is that we don’t understand the weight of answering the call to ministry. Some of the questions can reiterate the exact thing we’ve asked God. We are fully aware of how hard it is for women, of it’s unique challenges (in dating), it’s risk in choosing only a theological degree, the current state of our church, and the misconceptions about women in ministry. We’ve heard it all. We’ve even asked God about it. However, it boils down to the fact that we choose God over everything. We choose God over every obstacle. We choose his will and his way.” Above the idea of gender and religion, we need to recognize that Christ uses every unique person for the work He wants to do in us and through us. at Harvard as a law student at this same time. During law school, Ruth was in a male dominated environment that was not accepting of women. She, along with her other female law pupils, were chided by deans saying they had taken the spaces of worthy male students. Ginsburg through it all excelled once again and became the first female member of the Harvard Law Review. Even through difficult situations within her personal and work life, Ruth continued to show great strength and integrity. She went on to become the first female tenured professor at Columbia University and Rutgers University. Also, during the 1970s she was the director for the Women’s Rights Project of Civil Liberties. For which she argued and won six landmark cases on gender equality in front of the U.S. Supreme Court. In 1980 former President Jimmy Carter appointed her to the U.S. court appeals for the District of Columbia. She served there until being appointed to the supreme court by President Bill Clinton. Currently, Ruth Bader Ginsburg still serves as an U.S. Supreme Court Justice, the second woman to be appointed to this position. Even though Women’s History Month has come to a close, let us not forget the strong women in our lives who have made us into the strong young women or men we are today. Aminata: For those members of the student body who don’t know you personally, would you mind telling us a little bit more about yourself? Who is Alexia Griggs? Alexia: Well if you ask my friends, there’s that group of people where I’m like their big sister, there’s other people where I’m auntie --very family vibes, very mother goose. Aside from that, I’m really trying to figure out how to make everyone’s Oakwood experience better. That takes developing personal relationships with the members of the student body. Aminata: As you know, this month is Women’s History Month, and we’re reminded of the struggles women have faced but also celebrating the progress that we’re making. What do you think is the significance of remembering that and celebrating that? Aminata: For those members of the student body who don’t know you personally, would you mind telling us a little bit more about yourself? Who is Alexia Griggs? Alexia: Well if you ask my friends, there’s that group of people where I’m like their big sister, there’s other people where I’m auntie --very family vibes, very mother goose. Aside from that, I’m really trying to figure out how to make everyone’s Oakwood experience better. That takes developing personal relationships with the members of the student body. Aminata: So, being personable is very important for you then? Alexia: Yes, and it was very difficult campaigning, because people on my campaign team were like you need to go and meet everyone, and you can’t sit at cafeteria tables for more than a couple minutes. But it’s hard to leave when you’re having conversations. But that’s something I need to work on because you want to talk to everyone but there’s only so many hours in a day. That’s the biggest thing for me. I want people to know that president is my title, but I’m a person first. Alexia: It’s important to celebrate Women’s History Month for almost the same reason that it’s important to celebrate Black History Month. You must remember where you’ve come from and that it wasn’t always this way. At one point in time [and still in some places], women couldn’t own property or be in positions like leaders in student government or leaders at all. You were considered someone’s property; you belonged to a man. The fact that we’ve been able to make it this far and be able to aspire to dreams like owning your own business, like myself; that is a crazy dream for some people. This month reminds us to be grateful for that opportunity and gives some motivation to keep fighting the differences in how we’re treated as well. Aminata: This incoming cabinet is the first majority women elected cabinet, which is amazing. Do you feel like this will have any impact on your term or on the student body, and if so what kind of impact? Alexia: Definitely. Statistically speaking, African American women are the majority when it comes to African Americans in college. Because this is an HBCU, if that statistic holds true, that means our student population is majority women. Having more women in office is an advantage, because it gives us a perspective that we usually don’t have. As far as the cabinet, there will be a few more gentlemen in elected positions; I believe the more diversity you have, the better you’re able to see things and solve issues. With all the different perspectives, this means we will be able to get as close to the full picture as possible. Aminata: Is there anything you want to add or any words you want to leave with the women [and men] of Oakwood? Alexia: The things that people try to use to count us out are the things that make us special. If we learned to hone in on them, we could use them to our advantage. Women are different than men, that’s not a hindrance. I can use that to handle things in a different way. Never discount yourself because you’re different. You can do whatever you set your mind to. Period. Jesus said it, so why are you doubting? While this may not seem significant, Duke cannot afford to have these kinds of defensive lapses as the tournament continues. Duke allowed UCF to shoot 48% from the field and only shot 12 freethrows compared to UCF’s 20. Duke definitely has the offensive talent to outscore opponents but do they have the defensive talent and discipline to prevent teams from scoring back at will? I think the Duke Blue Devils are an extremely talented team but this year’s North Carolina Tar Heels team is destined for greatness. Similar to Duke, North Carolina’s roster is filled with proven scorers that can light up a scoreboard at any given time. This is why I believe that Duke and North Carolina will inevitably clash in the championship game and the Tar Heels will be ones who are crowned NCAA men’s basketball champions. Once again, the United Student Movement planned one of the biggest events that take place every spring semester: the annual USM Banquet. The theme for this year was â&#x20AC;&#x153;Wanderlustâ&#x20AC;? and USM gave students the chance to experience different countries around the world. The continents that we traveled to were Asia, Africa, and South America. The event took place at the Von Braun Center and students came dressed in beautiful and cultural attire. USM provided different stations for students to enjoy ranging from painting, henna tattoos, caricature and other activities. They also had a live performance from a Mariachi band while the students ate and mingled. The event was beautifully decorated and the students enjoyed their time at the Banquet. Whatâ&#x20AC;&#x2122;s Happening Outside of Oakwood?